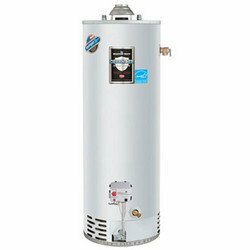 Explore popular Bradford White 40 gal gas water heaters. With the 40 gallons capacity, the following Bradford White gas water heaters are ideal for homes with up to two bathrooms. Bradford White Corporation offers a variety of natural and propane gas heaters with the capacity of 40 gallons and with the Atmospheric Vent, Power Vent, Direct Vent and Power Direct Vent option. Which water heating unit you will choose depends on the installation options inside your home, your preference and your budget. My recommendations are the Power Vent models, which are more expensive, but offer much more flexibility and increased efficiency and safety. Almost all Bradford White 40 gal gas water heaters that are atmospherically vented are using a draft diverter with the BW patented "snap lock" feature, which replaced the old screw-type installation. Water heaters from this series must be connected to a lined masonry chimney and use vent systems that are approved by the codes. The atmospheric vented water heaters are for indoor installation only, and either the room is small or large, an adequate air must be provided for proper combustion and venting. M-I-404T6FBN is the top pick due to its increased gas input of 50,000 Btu/hr and high recovery rate of 53 GPH. The previous two models come with the 40,000 Btu/hr and recovery rate of 42 GPH, as most of other Bradford White 40 gal gas water heaters. ICON System that features an intelligent gas control and thermopile which is using the heat energy to create electricity for the gas valve and microprocessor operation. ScreenLok System is used to prevent the ignition of the flammable vapor outside the gas heater. Hydrojet Total Performance System helps the water heater to reduce the sediment build-up and increase the First Hour Rating and efficiency. M-1-XR403S6FBN is the extra recovery gas water heater that provides more hot water in less time than the standard type. It offers all the superior features as the above Bradford White 40 gal gas water heaters, and comes with the 40,000 Btu/hr gas input and the recovery rate of 43 GPH. Bradford White D-4-403S6FBN is the high-efficiency gas water heater that utilizes an automatic flue damper, 2" thick Non-CFC foam insulation and built-in heat traps to reduce the stand-by heat loss and gas consumption. Such an energy-saving design allows D-4-403S6FBN model to get the Energy Star approval. Honeywell Self Diagnostic Electronic Gas Control eliminates the need for the constant burning pilot flame and with the help of the diagnostic codes makes the troubleshooting simpler. The unit comes with the gas input of 38,000 Btu/hr and 40 GPH recovery rate. Bradford White 40 gal gas water heaters M-4-40T6FBN and M-4-403S6FBN offer the same gas input of 40,000 Btu/hr and recovery rate of 43 GPH, but M-4-403S6FBN is shorter, wider and heavier unit. These gas water heaters are, thanks to the 2" thick insulation and installed heat traps, high efficient units, but are not Energy Star qualified. They still offer the advanced Bradford White features such as the ICON system, ScreenLok, Hydrojet and Vitraglass. Bradford White PE-4-403S6FBN and PE-4-40T6FBN models are designed to provide high energy factors and save more than one-third on the energy usage. A fully programmable LCD digital control, combined with the 2" thick insulation and heat traps are what reduce the stand-by heat loss and provide the efficient water heating. They come with the Honeywell intelligent gas control and spark ignition system. Both 40-gallon models offer 40,000 Btu/hr gas input and recovery rate of 42 GPH. PE-4-403S6FBN model is shorter but wider and heavier unit. There are three Bradford White 40 gal gas water heaters in this group that are designed as Low NOx units. Model U1-XR-403S6FRN is the extra recovery model, U4-403S6FRN and U4-40T6FRN are high-efficiency and Energy Star approved units that provide approximately 43 gallons of hot water, per hour and 40,000 Btu/hr. They are equipped with the Ultra Low NOx burner which ensures the correct air-gas ratio, for the approximately 75% lower NOx gas emission. 40-gallons water heaters from this series are designed specifically for manufactured or mobile homes. What makes M‑I‑MH40T6FLN perfect is the narrow width for installation in the tight space and roof jack package for flexible installation. Bradford White 40 gal gas water heater with the TTW1 Power Vented system, offers the flexible installation as a great alternative to the atmospheric vented models. Thanks to the powerful but quiet blower, you can run the vent horizontally or vertically, through the wall or through the roof, up to 120 ft. M-1-TW-40S6FBN model is the sole representative of 40 gallons heaters in this group that offers Defender Safety System, Hydrojet and other advanced and useful features. U‑1‑TW‑40S6FRN is the TTW1 model that is coming from the Eco-Defender series, and built as the Ultra Low NOx device. The Power vent system uses a pipe made of PVC, ABS or CPVC material that can run through the roof or wall. M‑4‑TW‑40T6FBN model is the high-efficiency unit, Energy Star approved, that is equipped with the thicker foam insulation. This is what allows this unit to heat the water efficiently than standard type units. It uses 2" or 3" PVC, ABS or CPVC pipe for horizontal or vertical venting and up to 120 ft in length. It comes with the Defender System and HydroJet Total Performance System. U‑4‑TW‑40T6FRN is not only Energy Star qualified unit, but thanks to the Eco-burner, Ultra Low NOx water heater which produces less greenhouse gases. PDX1‑40S6FBN is the Power Direct Vent model that is designed for the rooms that lack the fresh air for correct gas combustion. Direct venting and closed combustion allows the use of the outside air for proper combustion. This unit provides flexibility in the installation and its vent can run either vertically or horizontally. DS1‑40S6FBN is the direct vent model with the closed combustion that is using a coaxial pipe (pipe inside the pipe) for obtaining the fresh air for the gas combustion and venting the combustion gases outside. This unit comes with all the superb features that most of Bradford White 40 gal gas water heaters have: Icon System, Defender System, HydroJet and Vitraglass lining. Note: Either one of these Bradford White 40 gal gas water heaters you like, keep in mind how you select the size and what are the installation options. The above hot water heaters are built and marketed as 40 gallons but the actual available capacity is 70%, or approximately 28 gallons.